From folk to country to rock to gospel – there are plenty of musical styles where an acoustic guitar fits in perfectly. It’s also a fun instrument to learn for beginners to music. It provides its own natural amplification, meaning it’s easy to take to parties, the park, the beach, or any other location where you may feel like jamming. Acoustic guitars have a certain sound quality that’s hard to replicate. The natural reverberation produced by high-quality wood and carefully chosen body dimensions is a one-of-a-kind sound. That’s true in every sense of the term, since not even two acoustic guitars of the same brand will sound exactly the same. Sure, you may need a good ear for music to notice the differences. However, these differences are usually there and can be attributed to small imperfections in the wood, the thickness of the body’s finish or lacquer, and even minor differences in the manufacturing process. For this reason, it’s easy to see why acoustic guitars of different brands and price ranges have different sounds. While some get a deeper bellow from a roomier body, others enjoy a brighter sound from special types of wood. 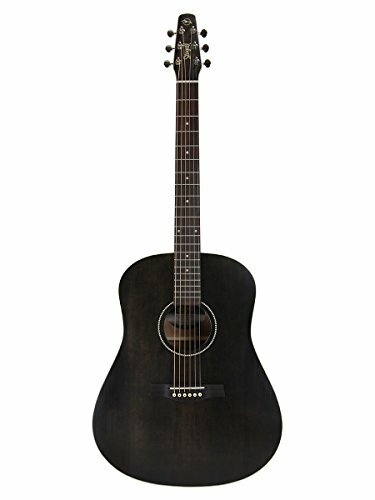 Which acoustic guitar is the best? That’s largely subjective – though it’s easy to say some are better than others. While two musicians may disagree about which acoustic guitar is better, it’s safe to say some models easily outrank others in terms of their craftsmanship and performance. When we pick entries for the list of best acoustic guitars, we take a few factors into account. The maker’s brand reputation is the first thing. It’s important to remember that while brands aren’t everything, they’re more than just the name printed on the headstock. Good brands gain their reputation as quality manufacturers from dedicated quality control and top-notch customer service. There’s also the obvious matter of rating a guitar by its quality. What does this mean, exactly? 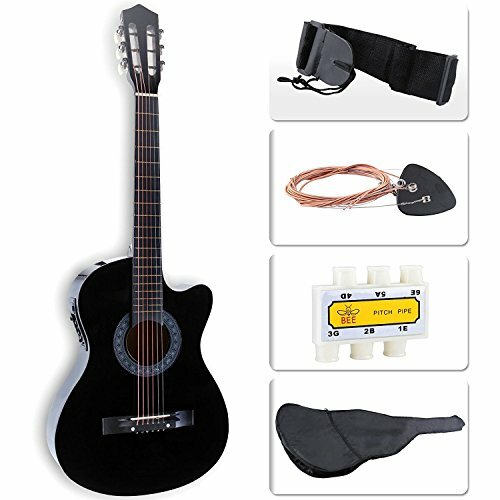 A quality acoustic guitar will have a good sound and good construction. The action will be low enough to make for comfortable playing, but also easily adjustable in the case of buzzing. It must have a good finish down to the smallest detail – the pickguard, the body binding, and even the quality of the tuning pegs all go into determining the instrument’s quality. Finally, and perhaps most importantly, we rate by feedback. Nothing says more about the quality of an instrument that a good review from musicians. When a person uses a guitar at a show, a studio, or even a bedroom jam session and gets good results, that means the guitar is worth checking out. Performance where it matters means more than anything – this also means a lesser-known brand can still be worth buying, provided their instruments have received good reviews. We weigh all these factors in comparison to the price to determine whether a guitar is worth trying out. Whether you’re a longtime musician who wants an instrument that checks all the boxes or you’re a beginner looking to get the most bang for your buck, these acoustic guitars are ones you should check out. Let’s get started! Martin – it’s a name synonymous with quality acoustic guitars. Though they’ve dabbled in electrics and even other musical instruments altogether, Martin has been well known for their acoustic line for decades. The D-16RGT is a great example of how a simplistic look can be deceptive – this model utilizes a solid Sitka spruce top and rosewood back to create a rich sound that resonates beautifully in the dreadnought-style body. The sound is good, but so is the playability, thanks to a Spanish cedar neck and Richlite fretboard. There’s care given right down to the smallest detail, as seen in the classic-style pickguard and natural gloss finish. Martin got their reputation by knowing what acoustic players look for. If you’re in the market for a guitar that looks great without the flare and delivers great sound without fail, check out the D-16RGT. Though it’s on the high-end of many peoples’ price range, those who have bought the guitar would say it’s worth every penny! Takamine may be one of the younger acoustic guitar makers on this list in terms of how long they’ve been in the game – but by the quality of their instruments, you wouldn’t know it. The GD93-NAT dreadnought acoustic guitar combines a beautiful solid spruce top with rosewood sides and a rosewood/quilt maple back. This three-part body provides for deep resonance, and that will sound a little more in tune. This is thanks to the split-design of the bridge piece, which helps improve intonation no matter where notes are played on the bound rosewood fingerboard. This guitar usually retails for around $500, though it can vary slightly depending on the seller. It’s a lot of value, as it offers a slim design with great looks and all the makings for high-quality sound. From the improved intonation to the elegant gloss finish, this guitar is perfect for those who value both classic looks and great sound quality. Seagull is another maker of acoustic guitars that may not be as recognizable as some others on this list. However, their guitars are often made in North America and given special consideration in the areas of playability and functionality. Consider the double-action truss rod, Tusq nut, and custom saddle piece – all three work together to provide for better intonation and thus a more accurate sound across various positions. Add in the tapered headstock which is designed for quick tuning changes and is also great for open tunings, and you have a versatile instrument that makes the player’s life easier. Seagull is something special in the world of acoustic guitars – their design choices are based around a distinct objective, which is making things easier for the people who buy their instruments. This guitar has a classic look, the materials that produce a great sound, and the design choices to make for a better-sounding instrument. Nicknamed “The Workhorse,” this guitar has been a part of many famous recordings and has stood the test of time. 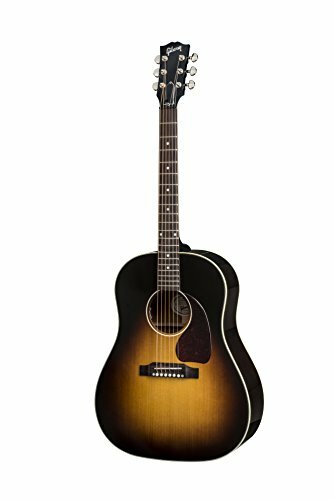 The vintage look is achieved by an aptly titled vintage sunburst finish, as well as a Sitka spruce top and mahogany back. The latter two features help provide the deep sound this popular Gibson is known for. It also comes with Grover Rotomatic tuners for increased tuning accuracy and mother-of-pearl dot inlays for that extra aesthetic flare. It’s another guitar that’s on the higher end of the price range for most buyers, but it’s reputation and features speak for themselves. It looks great, sounds amazing, and had no corners cut during the creation process. 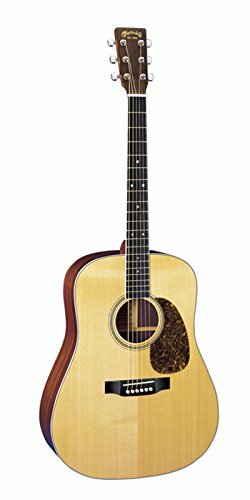 This is one of Gibson’s best acoustic guitars, a high honor considering the maker’s reputation. This is clearly in the “beginner acoustic guitars” category, but it still checks all the boxes on this list. As far as value and quality for your money, this model from Rogue is a solid choice and is hard to beat. It has a simple dreadnought body made from low-cost laminated whitewood and comes with a 20-fret Eastern mahogany neck. Good look, nice sound, great value. Rogue is a great name in the world of beginner acoustic guitars, and the RA-090 is a testament to this. The best part? It usually costs about as much as a dinner for two at a nice restaurant. 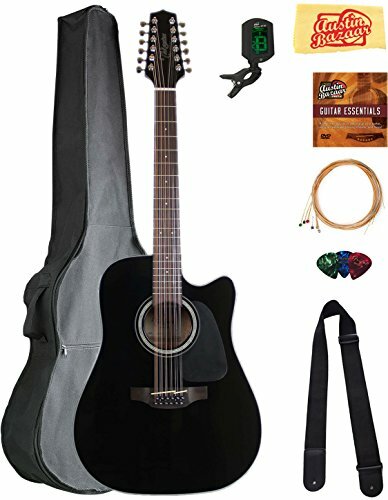 For anyone who wants a solid beginner, practice, or travel guitar, go with this model. 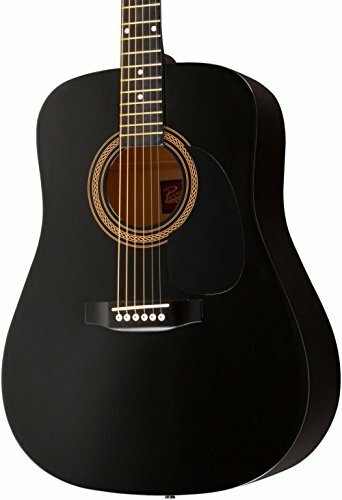 What list of best acoustic guitars would be complete without an appearance from Taylor? Made in America, constructed from premium parts, and beloved by players of all styles, Taylor is always a good choice. The 300 Series 314ce brings the big body rumble together with seamless playability – enjoy that cutaway, especially if you want to get to the higher end of the 20-fret scale! Made from Solid Sitka spruce and topped off with a beautiful gloss, this guitar looks as good as it sounds. It’s another guitar that is on the higher end of the price range, usually retailing for over $1,500 unless you can find a great sale. Still, it’s blend of premium wood and high-quality construction practices make it a great-sounding guitar. Yamaha is another popular maker of acoustic guitars that offers a wide selection. The LS6 is a great choice for mid-range guitars, combining a number of great features for a reasonable price. The spruce top is treated with acoustic resonance enhancement (A.R.E.) to reform the wood and help it produce better reverberation. Combine this with rosewood back and sides and an SRT Zero Impact passive pickup, and you’ve got a great guitar perfect for casual jamming and gigging alike. It looks great and sounds like what you’d expect from one of the most popular acoustic guitar manufacturers in the industry. This model has an elegant look and a sound that can deliver either unplugged or through the included electronics. As the name suggests, the AEW40ZW gets a lot of its unique sound and unique look from its exotic zebrawood. This material is used on the top, back, and sides. The guitar also comes with a cutaway to help you reach all the way to the 20th fret, as well as a mahogany neck to help you get there quicker. Send the unmistakable acoustic resonance through large stadiums with the built-in AEQ-SP2 preamp and Fishman Sonicore pickup! If you want something that catches eye and sounds great, go with this model from Ibanez. It’s built for convenience and designed for top-notch sound. Whether it’s with the wood alone or the high-end pickup system helping out, you can create many beautiful songs with this instrument. The name Fender may bring to mind Stratocaster electric guitars and classic jazz basses, but they’ve also got some popular acoustics on the market as well. This is another example of a great beginner/travel/practice guitar. It has a dreadnought body for that deep rumble, and a sunburst finish to help it look the part as well. The spruce top and Agathis back provide good sustain, while a rosewood fretboard allows for smooth playability. Just starting out? 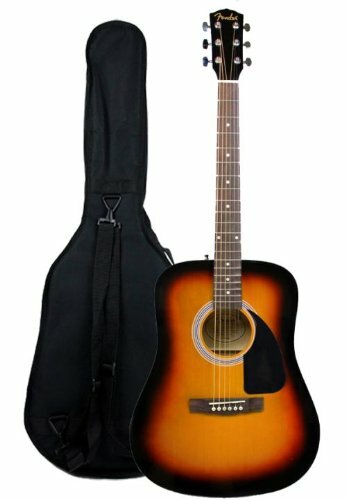 Looking for a solid guitar that you wouldn’t be heartbroken about if it got a ding or two during travel? This model from Fender balances looks and performance for a price that usually hovers between the $100-$200 range. Another guitar that proves quality doesn’t have to come with a bank-breaking price tag, the Epiphone Pro 1 is a great guitar for the musician on a budget. It has a gloss finish and unique bracing pattern that’s hard to find on some guitars that cost twice as much. Throw in a mahogany body and neck, and this guitar offers both great sound and playability. Looking to get a great guitar from a proven manufacturer that comes at a killer price? Look no further than this model from Epiphone – it has the classic look and solid sound quality that can satisfy almost any buyer. What’s better, a brighter sound or a deeper one? How about a more solid neck that makes it easier to pull out intense dynamics, or a fast fretboard that allows for quick playing? As we all know, music is an art and therefore subjective. There’s a lot of subjectivity that goes into choosing the right acoustic guitars, as well. When you’re shopping for the perfect acoustic, just remember to consider how much you want to spend and take a bit of time to research wood types, tuner brands, bridge styles, and other similar topics. It’ll help you get an idea of what type of guitar suits your playing style. If you need a place to start, any of the guitars on this list are worth checking out and strumming on.